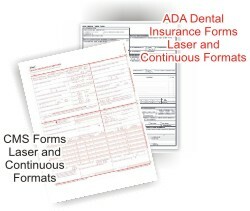 Lancer Ltd. has been providing our Medical Practice customers their CMS (formerly known as HCFA 1500) Health Insurance Claim Forms and our Dental Practice customers with their ADA Dental Insurance Claim forms for decades! Lancer Ltd. also carries a wide variety of stock statements that are compatible with many popular software systems used in these offices. While you're here to order the forms, you may as well order the envelopes that make it possible to mail them where they need to go!